So, my better half is all of 5 foot one on her best day. Resulting in beautiful but tiny hands. My question with the new P365 is the distance between the backstrap and the reach to the face of the trigger; what is the distance? Anything I can relate it to? We are likely headed to SIG Academy this year where we can try out all sorts of solutions for her, but I saw this on the cover of American rifleman and thought it might be a great answer ... then I saw it was a double stack which made me worry about Grip circumference. Thoughts? One more if I may, how is the trigger pull weight? 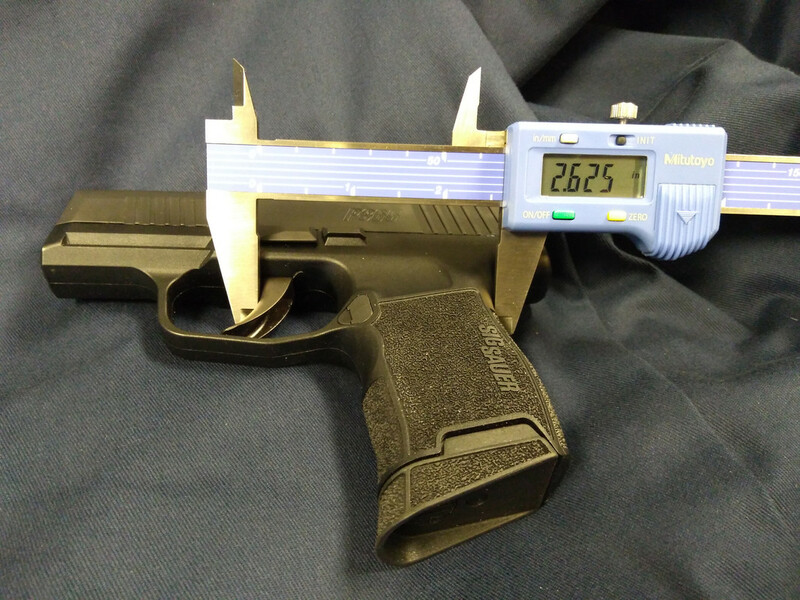 Anybody making that in the 3 1/2 to 4 pound range? How was the reset? The P365 is small but has comfortable ergonomics even for my regular sized hand. The triangular shaped magazine release button is moved more forward and almost flush than other similarly sized pistols but still easy to manipulate. The upper part of the front strap is undercut to allow a good grip. The front strap has shallow finger grooves. I do not have to adjust my grip when firing due to the factory grip texture. The newer X-Ray sights are easy to pick up since the front sight has a larger darker green ring around the Tritium cylinder. Take down and slide release is simple with unobtrusive left side controls. My wife has typical smallish hands. She grabbed onto my p365 and really liked it. Not sure on striker trigger pull but she had no issue with it. I love the fact you are going to the Sig Academy. Good for you being proactive. I can't help with trigger dimensions and the only way to do this correctly is get one in her hands. Over the years I have found people with XL hands can deal with a small grip. The opposite is not true. Hopefully the P365 will fit her hands because it is an awesome gun with a ton of firepower for it's size. I have very small but meaty hands and the P365 is now my favorite. Distance to the trigger face to me feels less than on a G43, and similar to a Kahr CM9. Racking the slide is much easier than say the Kahr, but probably on par or slightly heavier than the Glock 43. People with larger hands tend to have more issues with the P365 especially with engaging the slide stop while firing. Thank you for all your perspectives… Continued input welcome. 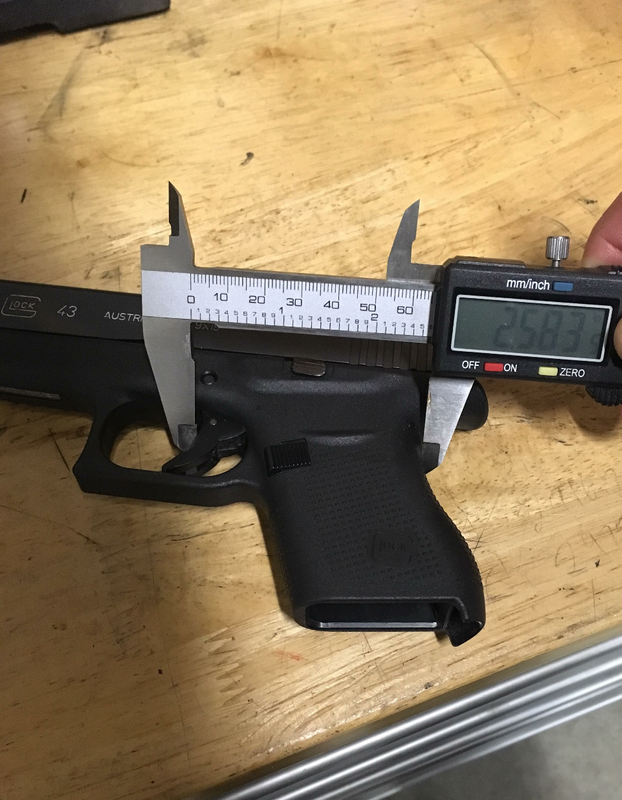 I read a review of this gun a couple days ago in a respected gun rag, and the author said that if one were going to own only one semi, this specific gun, and this specific size of gun, with the emphasis on the sort of unique sizing of this gun specifically, that this would be the gun to have. I thought that was an interesting comment. I should rent it sometime. Actually I should look more into this gun, I don't even know when it came out. I finally found a P365 today to handle (thought not to shoot, and it wasn't available for purchase). Everything I've read about it was quite accurate; most have said it's much smaller than one would think, and they were right. The closest comparison that leapt to mind for me was a Glock 42. 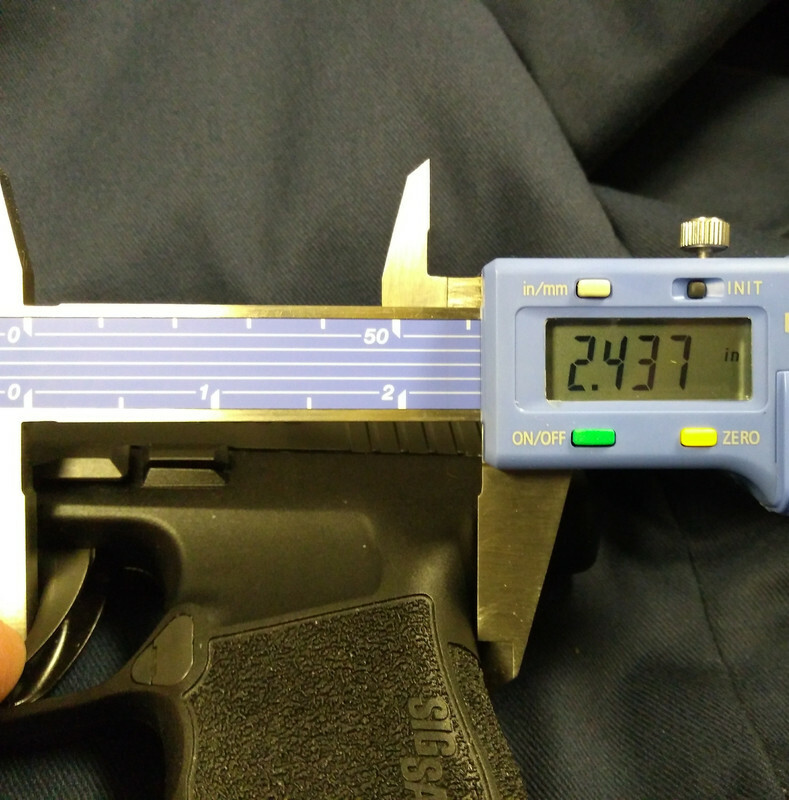 I often carry a G43, and this pistol felt smaller. It's not quite as thin, but it feels small. 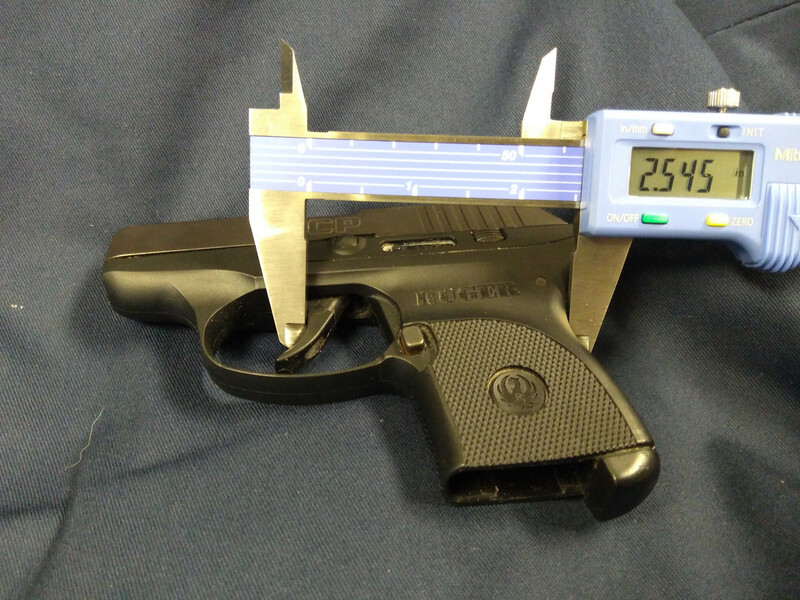 Someone with small hands will have no difficulty with this pistol. The backstrap is a bit wider than a G43, but the P365 doesn't feel blockish or thick like a G26. The backstrap is slightly wider than a single stack pistol, such that it will dissipate recoil a bit better through the palm and webbing of the thumb, but it's certainly a thin enough pistol for pocket carry or very comfortable inside-the-waistband carry. The trigger felt to me very much like a P320. I tried the 12 round magazine; it wasn't overly large, but felt large compared to the pistol. I wouldn't carry it with the 12 round magazine, though I might carry the 12 round as a spare. If this pistol is reliable, it's perfect for a small concealed carry firearm. It would be great on an ankle holster, too. The x-ray sights were nice, especially as an out of the box offering. The pistol is short enough that with both thumbs forward, my support hand's thumb actually protrudes past the end of the frame. Length of pull from backstrap to trigger is comfortably short and wouldn't present a problem for those with smaller hands. I'll buy one to try when they become available. I found one Thursday and my wife and I got to shoot it this morning. She has smallish hands and said it is the best feeling pistol she has ever fired. Size of the grip, reach to the trigger, trigger pull, position where the trigger breaks, recoil, racking the slide, they are all the best she has ever encountered. It is everything that I have been searching for in a concealed carry pistol for decades. It will probably replace my P320SC, soon. I just need to put more rounds through it and wait for my 12 round mags to arrive. I found one at a range, and shot it. It performed as expected. No hiccups, shot to point of aim exactly. The P365 seemed to jump in my hand more, but I think it was the small grip; I think a few hundred rounds through it and it would begin to feel natural. The trigger was just like a P320; the entire pistol was like a miniature P320, and it really is much smaller than one would think. It appears that the P365 would fit comfortably in the same desantis pocket holster that I use for the G43. I didn't get a chance to shoot it with the 12 round magazine, but the additional grip would have made it even easier I suspect. The x-ray sights are a nice addition. The lane in the range wasn't well lighted and I could still see the sights quite well. The pistol will be no problem for someone with small hands. I ended up doing a special order on a P365 and paid for one, before I left. They said they anticipated about a month. They had magazines in, as several places do around town. About fifty bucks each, and everyone seemed to be carrying the 10 and 12 round magazines. I'll end up getting several of each, I imagine. Can't help on the P365, but will pass along a tip on slide manipulation for any semi. 1) Bring the arm in close to the body and anchor the forearm or elbow on the side or front of chest. Gives better control and leverage than holding out front. 2) Firmly grip the gun with the strong hand (shooting grip). Cant it to a comfortable/neutral position. 3) Grip the slide with the weak hand. Try overhand and sling shot position and determine which provides the best purchase. 4) To manipulate the slide: (a) PUSH forwards with the strong hand (grip) and PULL rearwards with the weak hand (slide). This spreads the force required roughly 50/50 between the two hands. Most shooters hold the pistol firmly with the shooting hand and only pull the slide rearwards. This is fine if strength or dexterity isn't an issue. Being lazy, I've always believed in less work which is why I've always used the push-pull method. In our classes, I'll show the process to shooters who have issues with slide manipulation. Nearly everyone was able to easily manipulate the slide after. Thanks for these measurements. Very useful. Do you happen to have a G43 that you can do the same for? 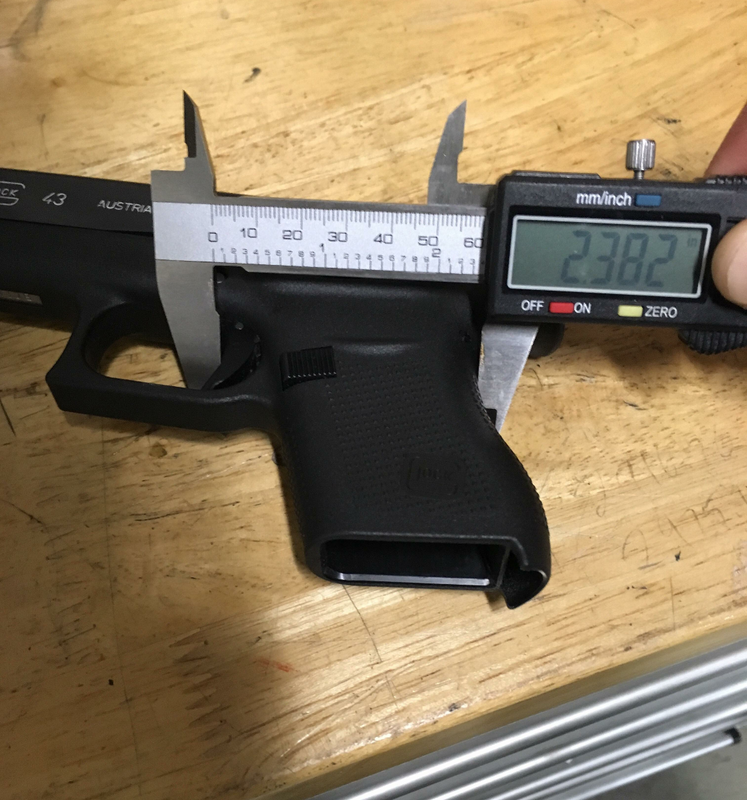 In addition to the measurements above for the P365, there is about 1/4" of take up in the trigger and about another 1/4" of pressing until the trigger breaks. At the point the trigger breaks, if you drew a line from the top of the curve in the trigger to the bottom point of the trigger, it seems to be perpendicular to the frame. I've found the slide very easy to rack as the nitro finish coat on the slide is quite grippy even without the slide serrations> they seemed to have thought of everything w this gun. This is from a friend of mine. P365 trigger depressed, light contact not jammed. Thanks to the guys who post photos with the calipers. Very helpful to those with dimension questions. Thank you very much for the photos!